Stephane Ginsburgh performing "Piano Hero #1" at Darmstaedter Ferienkurse 2016. "Immersion is the state of consciousness where an immersant's awareness of physical self is diminished or lost by being surrounded in an engrossing total environment, often artificial. This mental state is frequently accompanied with spatial excess, intense focus, a distorted sense of time, and effortless action." "If something startles the player out of immersion and into reality, out of illusion and into insight, then we have a moment of arrest remarkably similar to the instant when an antibody latches onto a virus. Suddenly, a shift in the system (immunological or ideological) occurs, and nothing remains the same." The "modern" grand piano, perfected in the nineteenth century, consists of a keyboard, a set of metal strings and an ingenious mechanism of hammers and dampers, which serves as the transmission between the pianist's muscles and the strings. 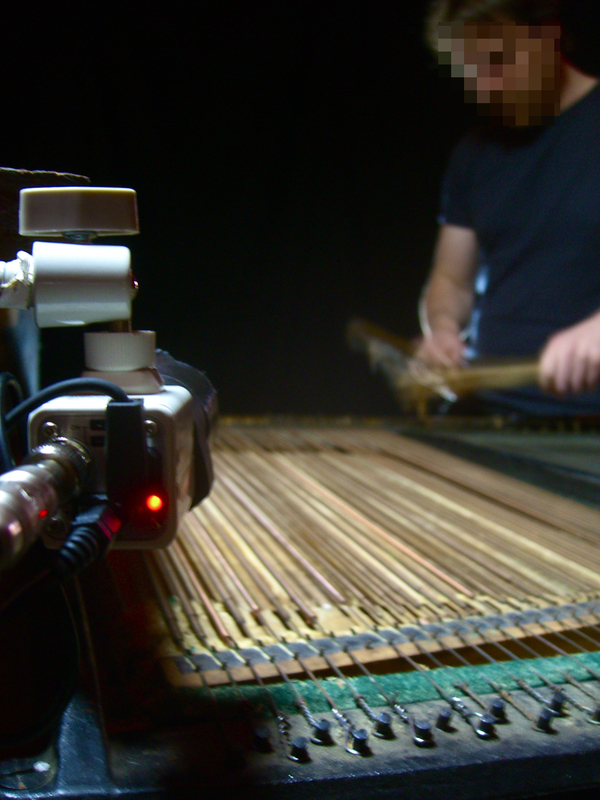 The wooden body of the piano amplifies the vibrations of the strings when they're hit by a hammer. In Piano Hero this configuration is "updated" and placed in today's context, using some of the typical artefacts of the 21st century: the keyboard now is an electronic one, the computer serves as the transmission and the strings are played by a virtual pianist -the avatar of the pianist of flesh and blood sitting on stage- while the wooden resonating body is substituted by a set of electro-mechanical speakers. Piano Hero #1 is the point zero of the Piano Hero cycle: the pianist becomes a mere operator in a world of bits and bytes. From Piano Hero #2 on, the grand piano (which has become a "fremdkörper" after the context-shift of PH#1) enters the game to fully articulate the tension between the real and the virtual, the human and the mechanical, the past and the present. More chapters in this cycle are envisioned and will be composed in the years to come. Piano Hero #1 is commissioned by and dedicated to Frederik Croene. Piano Hero #2 is commissioned by Huddersfield Contemporary Music Festival and is dedicated to Mark Knoop Further "Piano Heroes" are in process.